What’s wrong with the Singaporean Diet? Our obesity rates are nothing compared to the US and the average Singaporean looks quite slim and healthy. So why do we have to worry about our diets? What’s wrong with eating out at hawker centres for lunch everyday? The food in Singapore hawker centers is so irresistible! And it’s cheap too! How bad can it be to just eat lunch and dinner out? Cooking at home is such a hassle! In total, a day’s worth of meals like this would come up to 1692 calories, 211.73g carbs, 67.73g Protein, 63.63g Fats, 11.3g Fibre and 3149mg Sodium. 1692 calories is not an excessive amount of calories. Most people need a minimum of 1200 to function and the average daily recommended calorie consumption for people range from 1500 for women to 1800 for men. So if you need about 1500 calories a day and you are eating on average, about 1692, you are not going to be morbidly obese or anything. You might find your work pants getting a little tighter day by day but it will not something that you’ll really be too concerned about. And that’s the problem with most Singaporeans I think. In general, our calorie consumptions may be a little high but not excessively high enough to warrant everyone to be up in arms against high calorie consumption. The recommended daily intake for fibre for women and men is 20g and 26g respectively. On a diet like this, you are only getting 11.3g of fibre. Lack of fibre has been linked to high cholesterol, heart disease, diabetes, cancer, hemorrhoids and IBS. The recommended daily intake for sodium is NOT EXCEEDING 2000mg or 6g of salt (1 teaspoon) as salt = sodium x 2.5 but a safe zone to be would be 1500mg. If you eat out at hawker centres daily, you are sure to cross the 3000mg mark everyday. High salt consumption has been linked to hypertension (high blood pressure), osteoporosis, stomach cancer etc. The recommended daily consumption of fat is about 57g for women and 79g for men respectively. Ideally, this should be in the form of fat that is good for your brain and heart such as monosaturated fat and omega 3s from salmon, nuts and coconuts. However, whatever you see in the daily intake chart is 64g of non beneficial fat. This animal fat (which is likely filled with antibiotics and hormones injected into the animal to fatten them up) clogs up arteries and leads to heart diseases, high cholesterol and a whole host of obesity related problems. The carbs most Singaporeans are eating also don’t contribute to health as there are far too many refined carbs which is useful for quick energy but since most Singaporeans don’t run to work, the carbs they are eating are not that beneficial. Wholegrain carbs would provide better nutrition as the average Singaporean diet is so severely lacking in fibre and minerals. 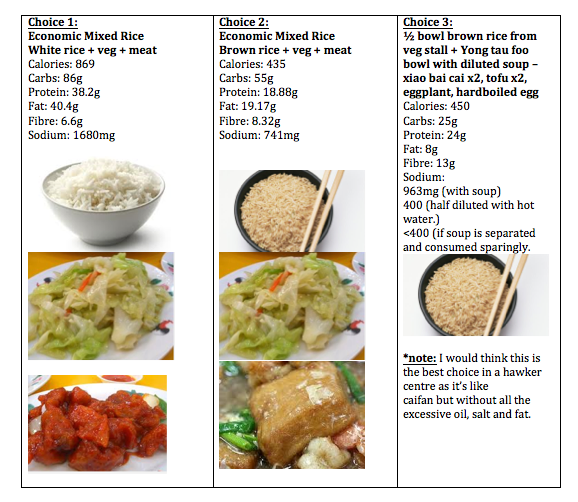 So you can see, for Singaporeans, it’s not really how much we eat that is the problem. It’s what we are eating and what we are not eating. It’s the lack of healthier choices around that’s really doing us in. Will we die of obesity? I doubt so, not yet anyway, though high salt, sugar and fat food can cause blood sugars to soar and crash and make you crave more food which may in turn lead to overeating. eating in hawker centres everyday, (who has time to cook these days?) then we will likely end up having a nation of (not morbidly obese) people whose daily dietary habits are leading them (unknowingly!) down the path of hypertension, heart disease and diabetes. We will grow up and be left wondering how we are not fat at all, don’t eat a lot- what’s 3 square meals a day and a couple of snacks?- and yet face all these illnesses. Many also believe that the next generation would be the first generation to not outlive their previous generation if such bad eating carries on. Firstly, learn to assess your food. Eat like a nutritarian- the greatest amount of nutrition for your calorie buck. I hate to break it to you, but you will likely not find a low sodium dish in a hawker centre at all. Even a simple bowl of wanton soup has 670mg of sodium in it. In the table above you have 3 choices. If you are a calorie counter, you may end up with choice 2 which obviously is not as nutritious as choice 3. (This is why, PLEASE STOP LOOKING AT FOOD AS NUMBERS) If you are gunning for the most nutritious lunch in a hawker centre then choice 3 would obviously win over the other two. Learn to assess your food in such a way that you make the better choice. Swap your high fat meats for leaner protein options, don’t just think that veg is the best option- consider if it’s been fried to oblivion in oil. Swap your white rice for brown if you can but don’t think that that magically makes your meal top of the class. It makes it healthier but if your accompanying dishes are unhealthy, why then congratulations, you’ve added a grand total of 2g of fibre to your meal only. There is a lot of misconception with brown rice being better than white. (see post on Brown Rice vs. White Rice) In my opinion, brown rice is better than white rice ONLY if there are very little high fibre/ mineral rich options around (like, sadly, in a Singapore Hawker Centre) and you need the carbs for high energy work. Brown rice essentially only has about 2+g more fibre than white rice and a couple more vitamins and minerals. If you are an office worker and not going to run a 5k post lunch, then you are better off spending the 216 rice calories (whether on white or brown rice) on more vegetables or other types of food to get whatever you may be lacking. A swap like that will give you more fibre, more vitamins, more minerals than rice but not the post lunch carb snooze. Essentially, what you are doing with the swopping is replacing 216 calories of 4g of fibre (brown rice) with 2 additional servings of veg, which will give you 6g of fibre instead and a whole plethora of vitamins and minerals based on the fact that you want the fibre and vitamins/ minerals but don’t need the wholegrain carbs since you are not engaging in any manual labor post lunch. 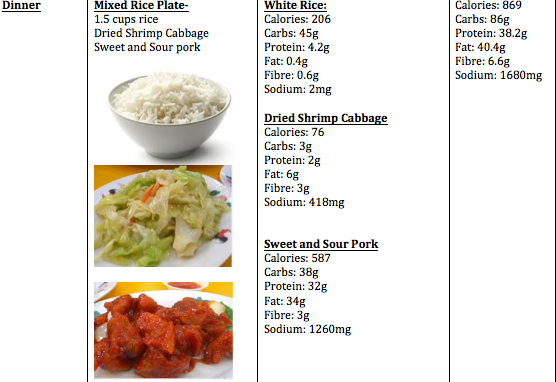 However, if you do swop rice for veg, you are going to have to eat A LOT of veg to hit 200 calories for your daily calorie intake to maintain your metabolic rate. If you are unsure how to do it, I suggest replacing half of your rice with more veggies first (hopefully not the oil drenched ones from the caifan store), while you educate yourself on nutrition swapping. Also, I know rice is just comforting to some (myself included) so it’s important to at least have SOME at every meal for some people. The bottom line here is that there is no bad food, there are only smarter choices- choices that are lower in unhealthy fats, sugar, salt and give you more nutrition calorie for calorie. Secondly, learn to pack food to work. The idea of ‘healthy food’ in Singapore is just too westernized. Everybody thinks it’s salads and museli and oatmeal etc. And have you seen the price of a salad recently? $12 for a bowl of leaves? It may be nutritious and good for my heart but my wallet is having a cardiac arrest right now. Packing food helps you save money and helps you eat better. Healthier eating is not oatmeal and salad everyday. It can be curry with less salt than the hawker centre’s offering, it can be veg, otah and salmon or rice and hot, nourishing soup- the possibilities are endless. As long as it’s homemade, it’ll be healthier, and that’s all your heart needs. Actually caifan or anything in the hawker would be great if it went back to the portion sizes and oil/salt levels of yesteryears. But since it wouldn’t, the healthiest would be to bring your own food till all the hawkers moan the lost of your dollar and start slashing the salt/oil levels to woo you back. I’ll be doing a series of posts soon on the most time/ money saving ways to plan, prepare and pack lunches for work. I promise you only need to cook once a week and preparation in the morning is 15 minutes, tops. Bringing your own food to lunch is the best as it gives you full control of what goes into your food and helps you to eat a better and wider variety of food to get a range of nutrition. (I think that hawker centers generally always serve the same thing so it’s hard to get a rainbow of vitamins and minerals). If you just switch 1 meal a day to a highly nutritious home made meal, you will still reap a lot of benefits from that single meal. Every single line I'm thinking MY THOUGHTS EXACTLY! May I ask what application or website u are using?